Former schoolteacher learns to listen to the inspiring stories of the homeless people she serves — and finds herself transformed. At 5:30 a.m. my alarm starts beeping. I snooze until about 6, take a quick shower, put my hair in a ponytail, and then I’m out the door. Inspiration Cafe awaits. When I arrive, a chorus of “Good mornings” welcomes me. Bacon sizzles in the oven. Diced tomatoes, yellow squash, green peppers and mushrooms sauté on the stove. Fresh cut flowers, donated by a local grocery store, sit on each of the 12 tables. By 6:30 several pots of coffee are making the rounds. Red plastic mugs and today’s Red Eye newspaper crowd the tables. Motown favorites play on the radio. I move among the tables, taking orders and refilling juice glasses. Seafood omelets with hollandaise sauce, breakfast burritos, fresh fruit pancakes — strawberry, banana, mango — the choices go on and on. This is how I like to start my Friday mornings, as a volunteer serving breakfast to men and women struggling to secure housing and employment in Chicago’s Uptown neighborhood. This is Kevin’s first week at Inspiration. He shakes my hand and thanks me for being here. Mary is quick to show me pictures of her new grand baby. Howard tells bad jokes that make us laugh in spite of ourselves. Janice talks about an upcoming job interview. Robert gives me the latest in sports. Nearly 74,000 people experience homelessness each year in Chicago. Nationally, the numbers catapult to more than 744,000. Inspiration Cafe in Uptown and its counterpart, the Living Room Cafe in the Woodlawn community on the South Side, offer restaurant-style meals, case management, employment services, cultural events and subsidized housing as a means for individuals to overcome homelessness and rebuild their lives. Inspiration serves more than 2,000 people annually and close to 50 every Friday morning. The only catch is that I’m a terrible waitress. I can never remember if someone wants ice in their juice or not. I mix up the artificial sweetener and the sugar packets. And more often than not, I’m too busy chatting to notice an order is up. The only skill I’ve managed to hone is listening, and it has totally changed me. Two years ago I started asking if anyone wanted to tell me their stories. I decided to interview those who expressed interest. Michael Korzun was one of the first. He secured his apartment through Inspiration after being homeless for three years. Now Korzun works downtown and comes to the cafe on his days off to spend time with his friends. His interview is short, 15 minutes. It’s all about this woman whom he loves, how they met, how they care for one another, how he worries he’s not enough for her. At the end of the interview, I ask him what it means to tell his story. “This is the first time I have someone in my life that really matters to me. That’s what it means to tell my story.” I smile. But the truth is I’m disappointed the interview is all about her. I tell him his story is like a beautiful picture and we need to frame it with some information about him. He says he’ll think about it. A few weeks later Korzun wants to tell me more. We meet. Once again, it’s all about her. I thank him. I tell him I don’t think his story will really fit with the other stories. But I promise to type it up and decide I’ll give it to him as a gift for her. Months pass. I start working on his tapes. I listen to how they sit by the lake, how he writes her poetry, how he’s afraid he’s not smart enough for her, how he can’t wait to take her out to the theater like the men and women he sees downtown, how he has to go to a thrift shop to get a button-down shirt for a wedding they’ve been invited to. I am so busy thinking about what a lovely gift this will be for Korzun’s girlfriend, I can’t even see what a gift his story is for me. I take a break. Go for a walk. And it hits me, stops me cold. When had I ever looked at a man or woman on the street and thought about whom they loved? Korzun’s story opened my eyes. We are all human. And we all love. Volunteering, I’ve learned, is as much about the gift we’re offering someone as it is the gift they’re offering us. It’s an exchange. We change them. They change us. And when we’re open to the exchange, the good we do grows exponentially, in all different directions, and in ways we cannot even begin to imagine. Karen Skalitzky (WCAS91), of Chicago, taught withTeach for America and now coaches teachers. 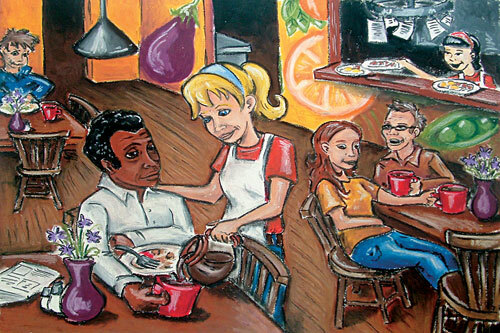 She wrote A Recipe for Hope: Stories of Transformation by People Struggling with Homelessness (ACTA Publications, 2006). We’re always on the lookout for fresh alumni insights. If you’d like to submit an essay, visit our web site for guidelines: www.northwestern.edu/magazine.